Surprisingly solid for a demo, Escape The Fate has a bundle of tracks you'd hear later on There's No Sympathy For The Dead and Dying Is Your Latest Fashion, but a couple which are exclusive to the demo as well. "Make-Up" and "The Structure Falls" are both pretty good songs, and it's surprising that they didn't get re-recorded later on. Ronnie Radke sounds decent enough, though the screams here are very, very rough. 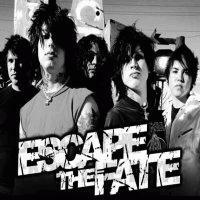 Fun stuff, as was par for the course with Escape The Fate back then.